Things here have gotten very bad. My girl, when you opened the Way, something happened. It has been weeks since you left, and spring has still not come. The rains continue, every day. Winter has been creeping back in. The river through town is flooding, and none of the farmers have been able to put in their crops. I am afraid that something from that world is spilling over into ours. You must come home at once. I need you here. But Fer can’t go home yet. Ever since she went through the Way, she’s felt an attachment to this new world and its magic, and senses that it is perilously out of balance. The key to healing the land and defeating its powerful ruler lies in Fer’s past and the parents she never knew. She must discover who she is and unleash her inner warrior before the worlds on both sides of the Way plunge into a never-ending winter. Why did I read this book: I have been eyeing Winterling since the end of 2011, but haven’t ever found the right excuse or nudge to read the book – until now. With the cold winter approaching, and being in the mood for cold, dark fairy tales, Winterling seemed a good fix for my reading malaise. Jennifer – Fer, to her friends – isn’t much like other children. She feels ill and fuzzy and slow the further away she gets from wide open spaces and trees, she’s teased by her peers for smelling weird (thanks to her grandmother’s herbs, which Fer must carry everywhere for protection) and acting weird (thanks to Fer’s penchant for rolling around in the underbrush outside). Fer has always felt like she doesn’t belong – and one night, when she saves a dog-who-is-a-boy from being attacked by two savage wolves, Fer learns the truth. She is from a different world – one across The Way, filled with magic and wonder. When she was just a baby, her human father left Fer behind to find his beloved, Fer’s fey mother. Though he swore to return, Fer has grown up without either parent and under the loving – if stifling – watch of her grandmother. Now that she knows the truth, Fer embarks on an adventure across The Way, to find her erstwhile parents and to discover answers to the questions she’s always had about herself. What Fer finds in the other world, however, is a sick land locked in eternal winter under the rule of a false Lady – and Fer is this world’s only hope. Winterling, the first book I’ve read from Sarah Prineas, is a familiar melange of standard fantasy tropes. That is, the orphaned protagonist, who is gifted with exceptional magical powers, who must fulfill her birthright and be the One Who Will Save Us All and RETURN SUMMER TO NARNIA! Which is to say, Winterling doesn’t exactly break any new ground, and I felt a little weary as I progressed through the novel because the setting and story is so familiar. But… perhaps that’s not entirely fair. There is some originality to Winterling, particularly in the blending of mythological schools and fairy tropes. While the standard rules are in place – compelling answers with the asking of three questions, seeing stones, binding oaths, etc – I appreciated Prineas’ blend of Shakespeare, the Wild Hunt, and even Celtic and Arthurian legend in her world across The Way. And, to Winterling‘s credit, the book is written beautifully with a simple yet evocative style (I especially appreciate Sarah Prineas’ economy of words). Not to mention, the book’s thematic messages of free will, self-discovery, and friendship aren’t too shabby, either. On a protagonist front, Fer is noble-hearted, strong-willed, and kind. She’s the perpetual outsider who must walk a treacherous path to right all the wrongs of the false Lady (the Mor), but makes nary a misstep in its fulfillment. In other words, Fer is great and all, but she’s also kinda one-note, and a little…well, boring. Far more interesting, to me, were secondary characters Rook, and the villain of this piece, the Mor herself. A shapeshifter who goes by many names, Rook is a puck and thrice-bound to The Mor’s service. To me, the best parts of this book involved Rook and his own internal arc – from his reluctance to serve, his repeated attempts at escape, and his grudging friendship with Fer. And then, there’s our villain, the False Lady who hides behind her beautiful glamour, who hunts and kills and feasts on the flesh of those slain. The Mor is manipulative and hungry and frightening, and I enjoyed her character very much. 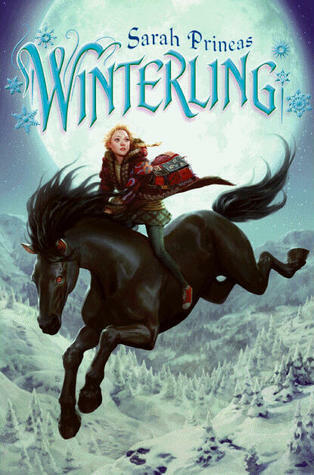 Overall, Winterling is a sweet, quick read and one that I have no qualms recommending (especially for younger readers who might not be as well versed in fairy tales and tropes) – that said, the book lacks the depth and resonance of, say, Anne Ursu’s Breadcrumbs. I’d say that throughout the series, Rook has the most interesting character arc. One of the things that I love most about these books is how many characters — heros, villains, warriors, healers, gods, minor background fillers — are female, and that there isn’t any big deal made about it. Hapax – that’s a good point! I do very much like the majority female characters in Winterling and their integration in the story. A question for you: does the series get better/worse, overall? Should I get Summerkin? I’m a little on the fence. The series pretty much stays consistent throughout. If you like the lyrical writing, love of nature, majority female characters, and Fer’s loving, kind, sweet personality, those all continue. If you’re looking for greater depth, any serious exploration of the implications of Fer’s choices, or any nuance between Right and Wrong… not so much. Like I said, Rook remained the most interesting character to me. And both of the remaining books had a real “Oh, come ON now!” moment (for me, at least) at the climax.